November 17, 2010 by Venky. A line up of 16 riders. 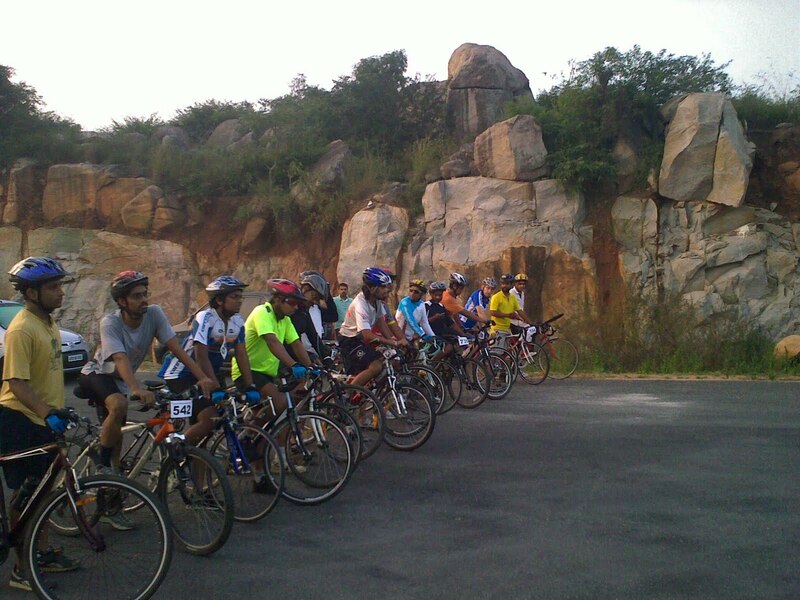 Prasad on his target, Raman on his Act110, Dasari Rajashekar on his roadpro, Sunil DesiSuperman Menon on his Orbea Mud, Gokul on his Schwinn Cutter single speed, Krish of TBA on his Merida Crossway, Maninder on his Lumala, Sreekanth on his SRAM Force decked Cannondale, Srinivas on his Act110, Bala on his Bianchi Nirione7, Krishna, Sam on his F9, Gordon on his PlanetX mean machine, gr on his Sport1 and Puneet on his BSA Mach. It was a spectacular sight. There was no gun fire signaling the start. A simple get, set, go.. and off they went. The bikes jumped into action. The riders fired up to do well. There was Maninder channeling his teen adrenalin to power-up his Lumala truck. There was Gordon’s calculatedly high cadence and rhythmic surge. There was Sunil’s lung power display keeping ahead of the pack as always. As expected, the first lap finish was with riders more or less coming in bunches. But as the lap count increased, the field was very much spread out. Even then, there were quite a few races with in the race. Gordon and Sunil played cat and mouse for almost six to seven laps before Sunil was finally able to shake Gordon off. That was a great display of experience and grit by Gordon giving the younger rider a run for his money. Sreekanth and Bala fought hard for third spot for almost five or six laps before Sreekanth’s steady effort managed to build a gap between himself and Bala. Bala was then given a chase by Sam on his knobbie tired Cannondale F9. They played catchup with each other for almost eleven laps before Sam managed to just pull ahead and finish fourth overall. A commendable show on an MTB. Bala fresh from Himachal MTB, the toughest MTB race in India, has put up a great show although his war wounds from Himachal MTB just about healed. gr who turned up with the intent of volunteering ended up racing as not many volunteers were required. gr, Prasad, Dasari, Raman, Srinivas, Gokul and Krish all maintained a steady effort and competed with themselves to finish the race strong. Puneeth on his BSA Mach single speed put in a good effort dispite struggling on his bike. I observed that even his seat height was not set up properly. He needs to raise the seat a bit further and needs to lose that aero bar immediately. Its just extra weight. Puneeth, are you listening? Pravanjan Das who arrived a lap late still went ahead with his participation and finished strong. Good job. Sunil who has managed to build up a decent distance between himself and Gordon finished first. Gordon came in a close second followed by Sreekanth at third overall. Sam finished next followed by Bala. Then came Maninder and Krishna followed by the rest of the pack. Krish took care of refreshment for the tired racers in form of energal packs, lots of bananas and bisuits. Deena who came in to race ended up volunteering to keep track of the lap counts as his bike began to leak air. Gareth kept the time while Aleem was busy with video coverage of the entire event with the help of his friend.